Two years ago, Alyssa Michnick and a group of shelter volunteers were faced with a reactive dog conundrum. You see, any individual dog of any breed or mix can be reactive. Through training, these dogs can become less reactive. A key part of that involves walking with other dogs – which brings us to the conundrum. Some people judge dogs they perceive as “pit bull” dogs differently than they would another reactive dog. They don’t view that dog as an individual. For that reason, Alyssa and her group had trouble finding people who would walk with reactive “pit bull” dogs. According to Alyssa, that compounds the isolation reactive dog owners feel. That isolation negatively impacts the dogs, because it can make owners feel like they have no options to help their dog. To fix this, Alyssa and other volunteers started a group for rescue and shelter workers in the DC Metro area who wanted to socialize all of the dogs in their care. They called the group ResQ Crew. To participate you need to fill out a simple registration form and then, once approved, join the Facebook group. And there are lots of different individuals and groups involved with ResQ Crew. It’s not only people who work with “pit bull” dogs. Dogs of every variety attend the walks. There is no discrimination or stereotyping. The excitement around ResQ Crew spread to dogs without reactivity issues. Some of the dogs are simply there for the socialization and exercise. 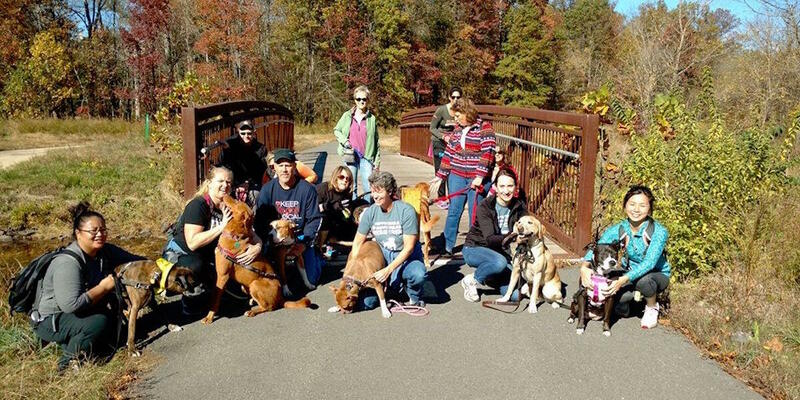 This interest has led to walks with lots of dogs – and we mean A LOT. Alyssa, who is now the Board President of NoVa Pets Alive, shared a personal ResQ Crew success story with us. Her own dog was extremely reactive prior to going on the walks. After a few months of regular walks, his reactivity was significantly less. She said he “still has his moments,” but he has dog friends now, dog friends whom he will lean on during walks. Since pictures are worth more than words, check out the dog on the far right of this photo – she’s almost out of the shot. That dog is NuNu. She couldn’t get any closer to the other dogs when this photo of her first time with the group was taken. Now see where is she six months later – She’s right next to the other dogs! The progress extends to owner support, as well. There’s no judgment in the group. Everyone is there to support one another – and support the dogs. Tie yellow ribbons to the leashes of reactive dogs. Watch your dog’s body language. You can learn more about NoVa Pets Alive! on Facebook.